Chef Kevin Violet of Chapin’s Restaurant was born in North Attleboro and grew up in Plymouth. His culinary education began at Cape Cod Tech and he went on to earn a degree from the Culinary Institute of America. Chef Kevin Violet has worked in some very fine kitchens. He completed his culinary internship at the Chatham Bars Inn and has worked at a resort in Bar Harbor, Maine and at the famous Ritz Carlton in Boston. Married, with 2 lovely little girls, Chef Kevin Violet loves cooking for his family. He is also a cycling buff, racing mountain bikes and participating in the Pan Mass Challenge for the last 5 years. A spinoff event of the Pan Mass Challenge is the Culinary for Cancer Cure of which Chapin’s Restaurant is a sponsor and Chef Kevin Violet one of the team leaders. While Chapin’s is a family style restaurant, they began a catering operation 4 years ago headed by Chef Kevin Violet. Their catering can be very upscale; recently Chapin’s catered a wedding for 200 people in Orleans for one of the producers of the Rachel Ray show. 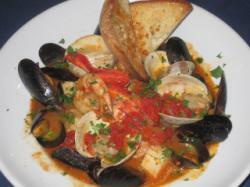 Chef Kevin Violet shares with you his recipe for Chapin’s Seafood Cioppino. 1. On low heat, sauté the celery and onions with the olive oil. Add all the rest of the ingredients except the seafood and parsley. Simmer for 1 hour and season to taste. 2. Add the shrimp, scallops and lobster and simmer for 5 minutes than add the mussels and little necks and simmer until they have opened. Garnish with parsley. 3. Serve in a bowl by itself or over your favorite pasta or with lots of bread.